TARL has long served as ‘the facility’ within the state of Texas where archeological collections of every size, in every state of preservation imaginable, and with any number of associated files (or the loudly-cursed lack thereof) have come to curated down through the decades as Texas archeology has evolved in theory and methodology from the large-scale excavations of the WPA era to satellite imagery and LIDAR of remote piloted drones conducting survey. 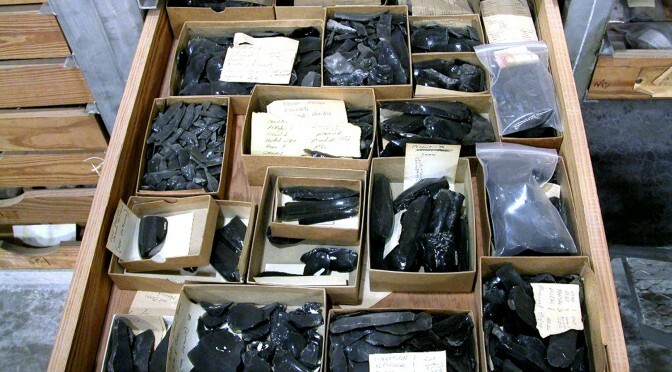 As modern methodology in the field of archeology takes us further and further away from the days of ‘collect everything as you go’ toward an uncertain future where acrheological data and interpretive value are measured in terabytes, server space and 3D printing potential, we here at TARL carefully consider the research value and volume of the collections resting on the shelves. Unlike the tiny digital footprint resulting from the virtual reconstruction of an excavation, the collections here range in footprint from the Herrera Gates to a 15′ long dugout canoe, to 40lb. metates and countless projectile points. It can take your breath away if you stop to consider what lies inside the drawers here…4,000 years of human occupation caught in a snapshot, framed with carefully spun cordage, meticulously worked (and reworked) projectile points, and rabbit sticks worn smooth by countless calloused hands. 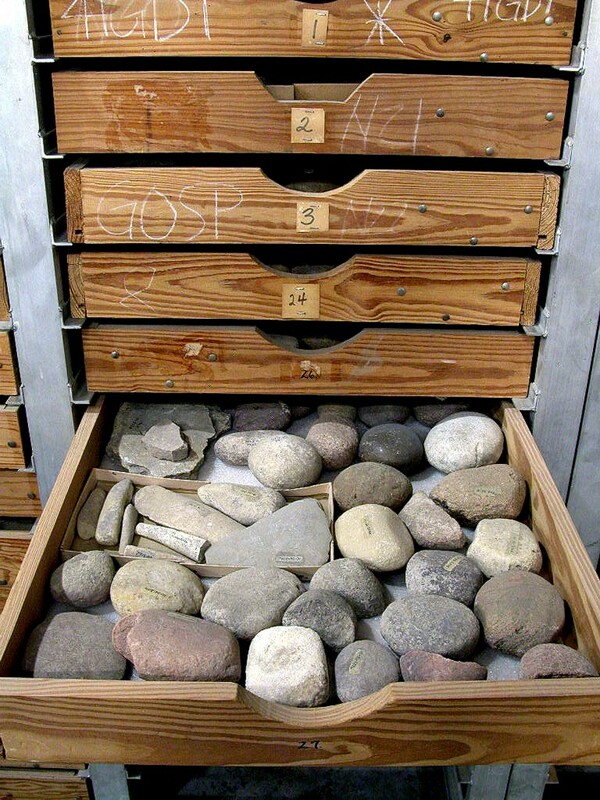 To the archeologically-uninitiated the drawers hold curiosities made of stone, wood and bone. To those of us who have the privilege of calling TARL our “place of employment” these curiosities are the remnants of a distant past that was recorded in rock art and pictographs as opposed to cellulose and pixels. But it takes time and resources to curate these irreplaceable artifacts of human history from our great state. We are a small staff dedicated to the care of millions of artifacts and miles of site reports and archeological records. As we have done so many times before, we are looking for volunteers. 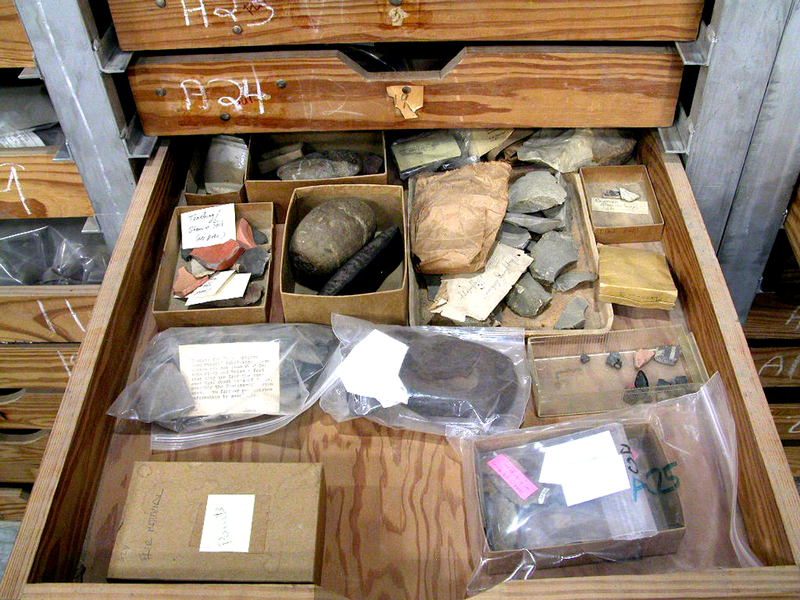 Marybeth Tomka, the Head of Collections at TARL, is interested in accepting volunteers to help her carry out the ongoing collections management tasks that allow these artifacts to retain their significance in history and prehistory. Collections, and artifacts at the individual level, are only of research value if they are properly recorded in documentation and entered carefully into a relational database that retains this critical information and makes it work for the researchers. Marybeth is responsible for seeing that all of the archeological collections which have been collected over many decades continue to be well-cared for and continue to be accessible to visiting researchers and archeologists. Students who volunteer at TARL are provided hands-on training in archeological collections processing, artifact identification and some laboratory methodologies (when she has the time). If you are a student interested in archeology, anthropology and/or museum collections management, the skills she can teach you through her volunteer program will assist you in your future professional endeavors. Don’t let the off-campus location deter you. The experience will prove well worth it and you’ll have the chance to work various prehistoric and historic collections and learn valuable skills from a trained professional archeologist. If you get your geek on the same way we do, if you want to have the chance to see the drawers that hold the history and contribute to our ongoing projects, contact Marybeth Tomka, Head of Collections at marybeth.tomka@austin.utexas.edu.